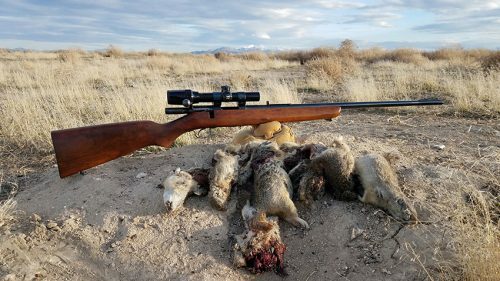 This past week, a good friend, Eric Mayer from California, came over to Arizona to spend a couple of days hunting prairie dogs. 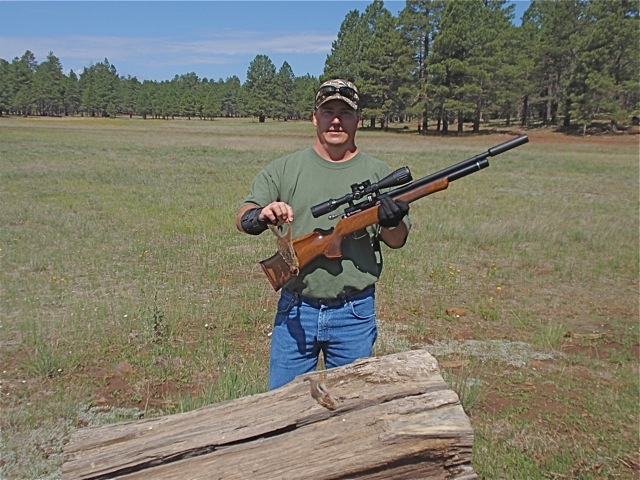 When he wrapped up that part of his adventure he headed up to the high country, here in Flagstaff, for a quick ground squirrel hunt. On Thursday, we headed out from my place at about 9 am. Roughly 45 minutes later, we pulled into the area that we were going to hunt ground squirrels in. This is the monsoon season here in Arizona, so I knew we would probably get rain later in the morning, or early afternoon. The days in July and August, typically start off with clear sunny weather in the early morning, but as the day moves along, the thunder heads build up, and by mid day we get rain, lightening, and thunder. Sometimes a little, and sometimes a lot. Many times there is also a huge drop in the temperature, and we will get hail included in with the rain. The point being, that if you can get in a few hours on the hunt, before getting blown out of the area by a storm, you’ve had a good morning. The area I had chosen for us to hunt in, was one that I had discovered a couple of months earlier, but because of a health issue, had never hunted myself. When I originally found the spot, I was just passing through, and being late in the day I didn’t stop. However, I did spot a few ground squirrels sitting on stumps as I passed by. I made a mental note to come back at some other time. Well, yesterday was the “some other time” and we were not disappointed. We had just stepped out of my 4Runner. I hadn’t even had time to open the rear hatch, when Eric points to a piece of old log, that’s laying in a meadow directly behind where we are parked. Sitting on that old log, glowing in the sun, are four ground squirrels. A nice sign of things to come. At this point, the scramble is on to get out a gun and get set up for a shot. 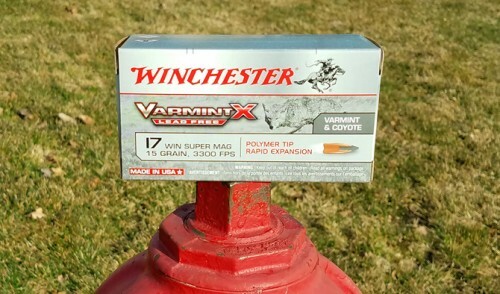 Eric had brought his Daystate Huntsman XL PCP, in .22, for the hunt. 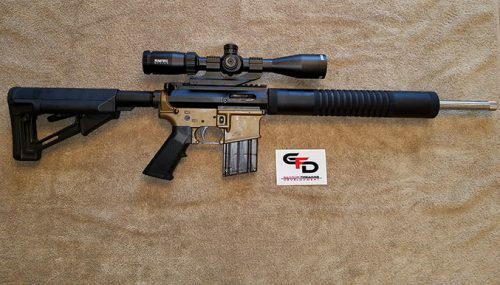 I had never seen one of them in person before, and I was really impressed when seeing the gun up close for the first time. Everything you would expect in a Daystate PCP was there. 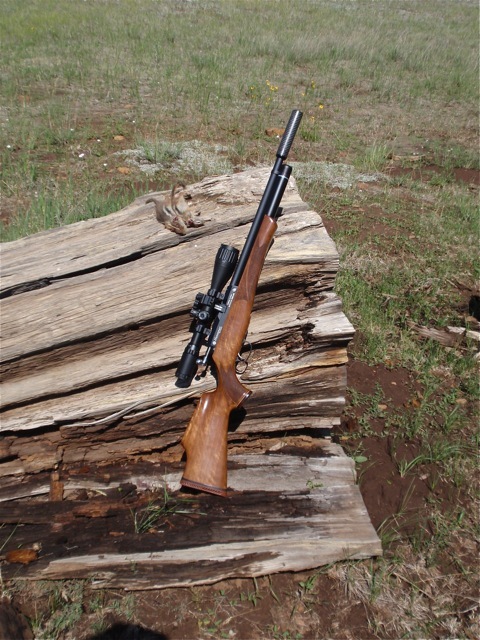 Beautiful fit and finish, with a very, very nice walnut stock. A class act all the way. 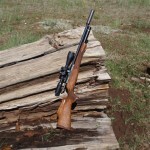 As Eric was digging out his rifle, I was busy getting out my binos and range finder. 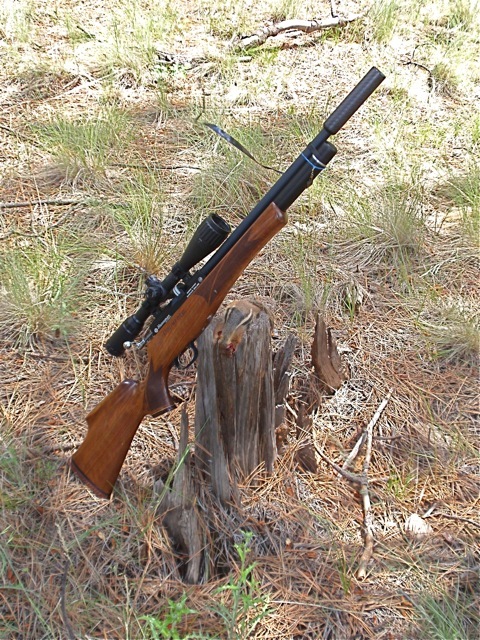 I shot a range to the squirrels, and it came back as 43 yards. Eric, using his monopod, set up for the shot, and dropped the first one with a head shot. Quickly racking the bolt, he dropped a second one, also with a head shot. The remaining two headed for cover. Not a bad start to the day. He was shooting JSB Exact pellets, but I don’t remember if they were the 16 grain, or 18 grain version. Huntsman XL with the first two squirrels of the morning. 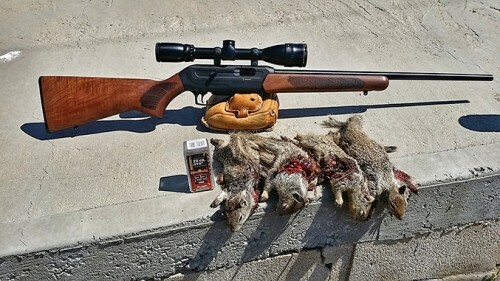 When you consider that the heads on these squirrels aren’t much bigger than a nickel, especially on the youngsters, which these two were, that’s some mighty fine shooting at 43 yards. We stopped for the necessary photo op, and then finished gearing up to hunt in the forest. I’ve developed an issue with my right rotator cuff, and this makes it very painful to bring a rifle up to my shoulder. 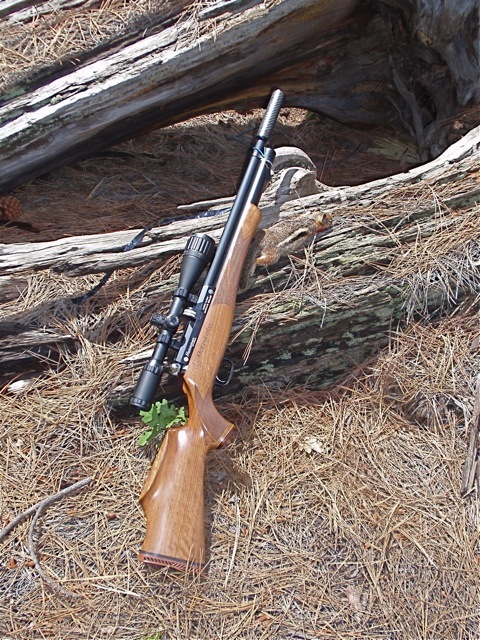 Because of that, I decided not to shoot, but to be an extra set of eyes while searching the forest for squirrels, and to also run the range finder, and Eric’s video camera. Hunting and shooting can be a little strange at times, and what happened next is one of those things that leaves you scratching your head. 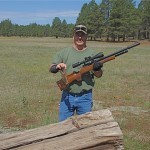 After dropping those first two squirrels with perfect head shots, Eric missed the next couple, at similar ranges to the first two. I don’t think it’s the shooter. Eric is an excellent shot. We all miss sometimes, but it was obvious that there was something amiss here. All of a sudden, an excellent shot, with a tack driving rifle, was missing shots he was making just minutes before. Hmm, well let’s do the most logical thing, and put the gun on paper and see what is going on. We stuck a target out at 35 yards, and after shooting a three shot group, we find out that the gun is suddenly shooting three quarters of an inch to the left. Say what? 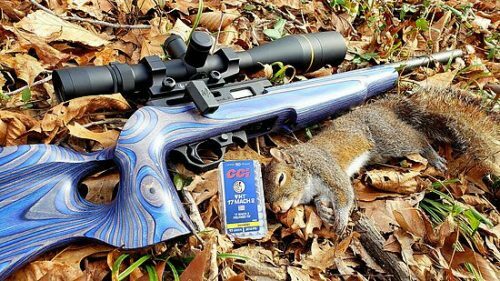 You know if it’s three quarters of an inch left at 35 yards, it’s shooting farther left than that at 45/50 yards, where the squirrels were, and more than enough to explain the sudden misses. Everything on the scope and mounts is snug, so who knows. Scopes can be very frustrating at times. Since time is of the essence, don’t ask questions, we’ll figure it out later, just make the necessary adjustments, and let’s keep on hunting. Squirrel that had been sitting on the old blow down root. After getting a handle on the poi issue, we slipped back into the forest on the hunt. 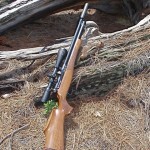 I don’t think we had gone 40 yards, when Eric spots a squirrel sitting on the very tip of an old blow down pine tree root. I shoot a range to it and get 50 yards on the nose. Using his monopod, he sets up for the shot. We’re back in business, when the shot broke, there was a nice loud THWOCK, and the squirrel tumbles off of his perch and out of sight. When we get up to the blow down, there he is laying on a bed of pine needles DRT. Another nice clean one shot kill. 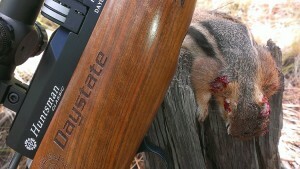 Squirrel rolled off of a stump, with a head shot, at 46 yards. 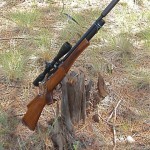 Continuing to hunt along, I next spot one at 46 yards sitting on a stump in the shade. Again, Eric dropped that one in place, with another perfect head shot. By now, we have been hearing thunder in the distance, and know we are running out of time. We decide to hunt for another 10 or fifteen minutes, and then work our way back to the vehicle. As we hunted along, he connected on a few more, with one shot kills, and when a very loud, and very close thunder clap hit, we headed for the 4Runner. It was perfect timing too. By the time we got back, and put everything away, we were starting to get a few rain drops. On the way back out of the hunt area, the sky opened up and we had a real gully washer going on, complete with hail. Lots of thunder and lightening all around. Not what you would want to get caught in while on the hunt in the forest. Because of the weather, the hunt was cut a bit short, but we still had a really good time. Eric got to sample a bit of high country ground squirrel hunting, in an absolutely beautiful Ponderosa Pine forest, and I got to see his Daystate Huntsman XL in action. We both had a good time, and that Huntsman XL rifle is exceptional. We’ll have to do it again sometime. This is a repost, with permission, from the VarmintAir Blog.